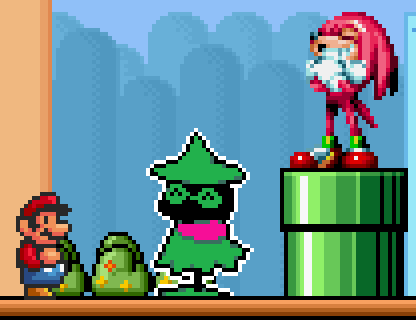 About the screenshot, Is Mario looking the other way in the image displaying the dummy sprite? He's supposed to be looking at he screen. Something small, but it's something. What's Knuckles doing here? I don't know. Download ... if you really want. It's literally just one sprite! I know this is a joke, but it actually looks pretty solid! Could be used is some kind of joke level. Don't worry people, a playable Steve will be coming! Can you add playable steve? This is a masterpiece. now we can finally play with our favourite edgy edgehog in smbx. thank you. If you couldn't, I wouldn't have put a download link! Yes, he replaces Toad, you know, in case you already have Mario and/or Luigi reskined. Whats with the yellow/red illuminati's eyes? If you're talking about there being no white part, there is. It's just kinda hard to see. What aboot that giant illuminati in the screenshot? MarioRPGExpert93 wrote: How about Metal Sonic from Sonic CD? I was actually thinking about making him. He might be coming in the somewhat near future.